Take a 2 quart container and put ingredients of your Fruit infusion. Then add 6 cups of ice. Fill the jar with water. Then stir, cover and refrigerate for at least 2 hours to let flavors infuse. Scrunch 8 fresh basil leaves to let their flavor come out. Combine with 3 cups halved strawberries and gently mixed with a wooden spoon or spatula. Combine 3 cups halved strawberries, 2 thinly sliced lemons, and 3 thinly sliced kiwis. Gently mix all of the ingredients. Mixed 1 cup pitted and halved fresh cherries, 3 cored and thinly sliced granny smith apples and 2 cups pineapple chunks. Scrunch 6 mint sprigs to let their flavor come out. Then combine with 2 thinly sliced limes and 3 cups cubed mango (fresh or frozen); gently mixed with a wooden spoon or spatula. Gently mixed 5 thinly sliced oranges and 2 cups raspberries. Scrunch 6 mint sprigs to release flavor. Combine with 4 thinly sliced limes and 2 thinly sliced cucumbers. Soak for at least an hour before serving 3 tangerines sliced, 2-3 sprigs of thyme, 2-3 sprigs of fennel, 1 quart water and ice. Mixed 1 cup sliced strawberries, 1/4 cup fresh mint leaves, 1 cup sliced cucumbers, 2 limes sliced, ice cubes, and water. 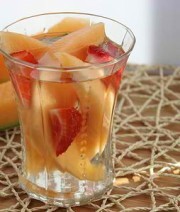 4 Cantaloupe cut in long wedges, 12 Strawberries cut in half, 1 quart ice and water. Let it sit for 20-30 minutes before serving. Then you can also add AuthenTea or Oolong Tea to have another zest of iced tea.